This crunchy Apple and Walnut Salad is tangy and sweet! 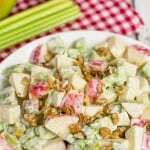 It’s the perfect combination of sweet and tart apples, highlighted with a creamy, lemony dressing. Makes a great addition to any family gatherings. In small bowl, mix dressing ingredients until blended. Refrigerate until serving time. Place apples in large bowl. Add lemon juice and toss until coated. Add celery to bowl with apples. Refrigerate until serving time. Just before serving, toss apples and celery. Add dressing; toss until coated. Sprinkle with walnuts.